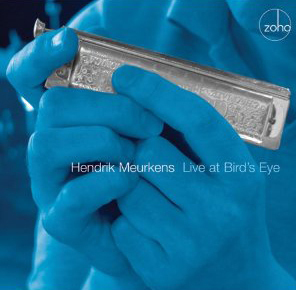 “I’ll grab the harmonica, you haul the vibraphone.” No doubt multi-instrumentalist Hendrik Meurkens has offered that suggestion or something akin to it following a concert in which he demonstrated his mastery of instruments alternately compact and cumbersome-concerts like those captured on Live at Bird’s Eye, recorded during engagements in 2008 and 2010 at the Basel, Switzerland club. Longtime fans won’t be surprised by the level of performance sustained by Meurkens and his seasoned bandmates: Russian-born pianist Misha Tsiganov and two natives of Brazil, bassist Gustavo Amarante and drummer Adriano Santos. The close rapport these musicians share consistently enhances the performances, and it is the principal reason why the pop standards covered here sound so vibrant. Mind you, that’s no small task when you’re dealing with tunes as familiar as “Body and Soul,” “Dindi” and “Estate,” but Meurkens and company accomplish it with verve and ease. Throughout, Meurkens switch-hits fluidly, though the chromaticism and percussion he generates on vibes, beginning with the samba-driven “Amazonas,” can pack a wallop. Sharp contrasts come into play when a melody as alluring as “Estate” surfaces and Meurkens uses his chromatic harmonica to warmly embellish the theme. Tsiganov, who is accorded as much solo space as Meurkens, often displays a rhapsodic touch on ballads and brings a hammering attack to Meurkens’ festive “Sambatropolis.” Meanwhile, Amarante and Santos make for a pitch-perfect pairing, subtly shading some arrangements (“Dindi”) and vigorously stirring others (“Nóa Nóa”).